How will I know if I have tonsillitis? When will I know when I am cured of tonsillitis? When should I contact a health care professional about tonsillitis? The large tonsils are two oval-shaped areas of lymphoid tissue that occur on the left and the right side of the throat. 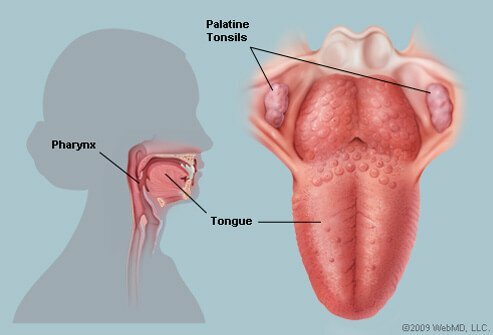 These tonsils are also referred to as the palatine tonsils. In addition, there are two lingual tonsils located at the base and the back of the left and right tongue. Tonsillitis is inflammation of one or both of the tonsils. The adenoids are lymphoid tissue located at the back the pharynx that often become infected with the same microbes at the same time as the tonsils. Most acute infections of the tonsils are due to viruses or bacteria and usually is contagious by direct person-to-person contact. Tonsillitis caused by a virus infection usually is contagious for about seven to 10 days. Bacterial tonsillitis can remain contagious for about two weeks. Some individuals can become chronic carriers of potentially infectious bacteria and can be mildly contagious for long periods of time. People who are infected by bacteria and are treated with antibiotics are considered non-contagious after approximately 24-48 hours of appropriate antibiotic therapy. a coating of yellow pus on the tonsils. tender and possibly enlarged cervical lymph nodes. The tonsils themselves are usually enlarged, reddish, and depending upon the infecting organism may have whitish/yellowish to gray-appearing pus areas on the tonsil's surface. The diagnosis of tonsillitis is usually made clinically by a health-care professional after simply observing the tonsils. However, other tests such as X-rays of the soft tissues or a CT scan may be ordered if there's some concern about more serious spread of the infection into the neck. In addition, throat cultures are done if strep infection is suspected while blood tests may be ordered to detect certain viral infections like mononucleosis. Tonsillitis is usually spread by direct and/or close contact with an infected person. Contaminated droplets produced by coughing, sneezing or kissing can be easily transmitted to another person with both viral and bacterial infections. Individuals can be cured of tonsillitis, both bacterial and viral types when the symptoms of swollen reddish tonsils and other symptoms go away (about seven to 10 days). Many individuals require no treatment, while some with a bacterial cause may need antibiotics. However, there are some individuals that may have symptoms go away, only to have them return within weeks or months. These individuals are not cured of tonsillitis but have developed chronic, recurrent tonsillitis that eventually may require surgical removal of the tonsils. swollen and tender tonsils with whitish or yellowish to gray-colored coating, or pain on only one side of the throat. Shah, U.K. "Tonsillitis and peritonsillar abscess." Medscape. Mar. 19, 2018. <https://emedicine.medscape.com/article/871977-overview>. Watch this pictures slideshow for more information about flu shots. Get the facts on different types of influenza vaccines and who should get one. Please share your experience with tonsillitis. What are your tonsillitis symptoms and signs? What treatment(s) did you receive for tonsillitis? Learn about the causes and symptoms of ear infections and how they are diagnosed and treated. Read about treatments such as ear tubes and antibiotics, which could prevent future ear infections. Infectious mononucleosis is a virus infection in which there is an increase of white blood cells that are mononuclear (with a single nucleus) "Mono" and "kissing disease" are popular terms for this very common illness caused by the Epstein-Barr virus (EBV). Strep throat is caused by group A streptococcus bacterium. Symptoms of strep throat include sore throat, white patches or spots on the tonsils, headache, and nausea and vomiting. Diagnosis of strep throat is performed through a rapid strep test. Treatment for strep throat is antibiotics. A rapid strep test is an easy and accurate test performed to diagnose strep bacteria, causing strep throat. A rapid strep test is performed in the health care practitioner's office. A rapid strep test can assist in ruling out other causes of sore throat, for example, flu, common cold, or mononucleosis. Treatment of strep throat is generally antibiotics. Desquamation of the hands, feet, elbows, and knees occurs during healing. See a picture of Scarlet Fever and learn more about the health topic. Explore the types and causes of a sore throat through pictures, including strep throat, and learn how to find relief from that raw, scratchy feeling. Take the Strep (Streptococcal) Throat Infection Quiz to learn about causes, symptoms, treatments, prevention methods, diagnosis, and complications of this common infectious disease. Strep throat is a bacterial infection of the throat. Signs and symptoms of strep throat include headache, nausea, vomiting, sore throat, and fever. Strep throat symptoms in infants and children are different than in adults. Strep throat is contagious and is generally passed from person-to-person. Treatment for strep throat symptoms include home remedies and OTC medication; however, the only cure for strep throat are antibiotics. Tonsillectomy is the surgical removal of both tonsils. A tonsillectomy may be performed in cases of recurrent tonsillitis, or treat sleep apnea and some speech disorders.